Yellowfin goby, approximately 10 cm (4”) long. Location: Suisun Marsh, California Date: 8/6/2007. Yellowfin goby, approximately 10 cm (4”) long. Location: Suisun Marsh, California Date: 8/8/2008. 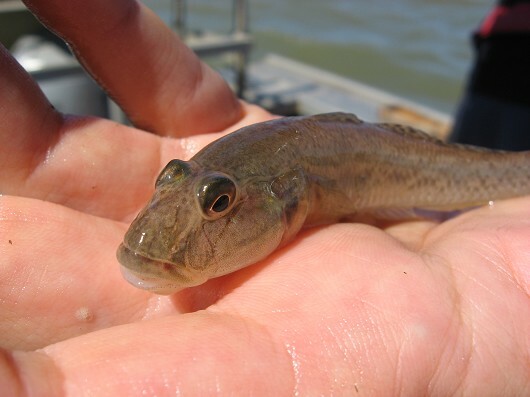 Yellowfin goby (head), caught in Suisun Marsh on 20 August 2008 by Teejay O'Rear. Photo by Amber Manfree. 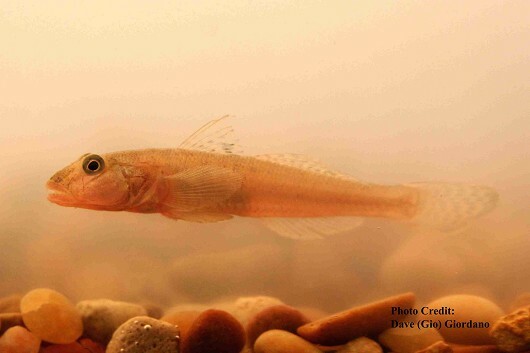 Yellowfin gobies are found in shallow, soft bottomed areas of fresh, brackish, or salt water. 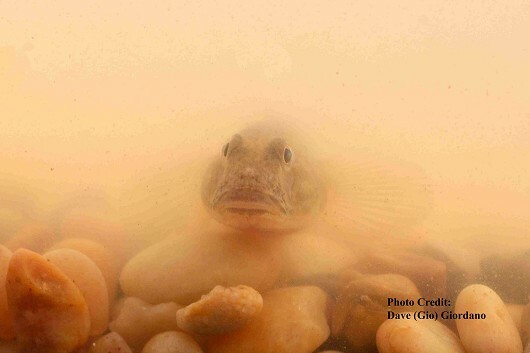 In San Diego yellowfin gobies have been found in salinities from 16 ppt to 40 ppt and temperatures greater than 28°C. The only restriction of the species seems to be that they require an area with salinities of at least 5 ppt in which to spawn. Yellowfin gobies can only swim short distances, and in a jerky manner, requiring them to use ambush tactics to capture active prey or to carefully rummage through the substrate for hidden prey. Smaller individuals feed on copepods and other small crustaceans but shrimp, crabs, and small fish make up the majority of their diet as they get larger. Males mature after one year while females mature after two. 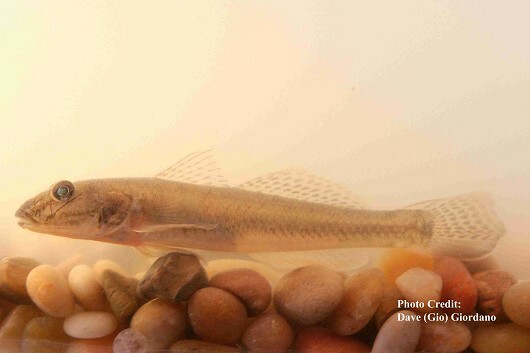 Spawning occurs from December to July but is most prevalent in March and April. All freshwater populations will migrate downstream to brackish water in order to spawn and, surprisingly, some saltwater populations will also travel inward to find a brackish spawning site. Regardless of population, males construct Y-shaped tunnels with two entrances out of mud and coarse sand, occasionally using pipes and other found materials to supplement their construction. Females lay 6,000-32,000 eggs that they attach to the roof of the tunnel. The male then fertilizes the eggs and guards them until they hatch 28 days later (at 13°C). The newly hatched larvae are pelagic and freshwater populations can use tidal currents to push themselves upriver until they settle down at 13-15 mm TL. By the end of their first year most will reach 10-14 cm SL, 16-18 cm SL by year two, and about 17 cm SL or greater in year three. Most only live for 3 years, but individuals as long as 22 cm SL have been found, suggesting that some may live longer.